wahhh... code geass again :) I was making a wall for a friend but she didnt like archer (fate stay/night), so the wall got... rejected? OX but at least I know she wants to watch code geass and she thinks that karen is very alike with cagalli (she likes cagalli), so here it is! nothing much to comment... I think I know how to use the pen tool by now, because this one is better than my two last vectors... also, had to resize it because it was too large for minitokyo :sweat: really! resized it like five times before! Really great! I can tell your outlines have improved. :o It's really good and it's way better than mine. :sweat: I mean it's more smoother despite it not being straight (not that I can blame you ^_^' ). Absolutely awsome job. i love it. You're right. Karen-san reminds me so much of Cagalli-sama. They are somewhat alike in terms of personality, attitude, and character. This vector of Karen-san is great. The vectoring was done so smoothly and I love the lines. I wish I could vector like this. Nice job. You're getting better! The colours are really good! you really did a clean and nice vector xD youre great! Its nice and kallens really cute XD. i like your work on code geass and wanna see more. KALLLEN LOOKS SO GOOD IN HERE. THANK YOU FOR VECTOR. wahahaaa! i lurvee cagalli too! hey yes. they are somewhat alike. the whole anime is somewhat alike to gundam seed. awesome vector! woot. Quote by JCzalaYou're right. Karen-san reminds me so much of Cagalli-sama. They are somewhat alike in terms of personality, attitude, and character. 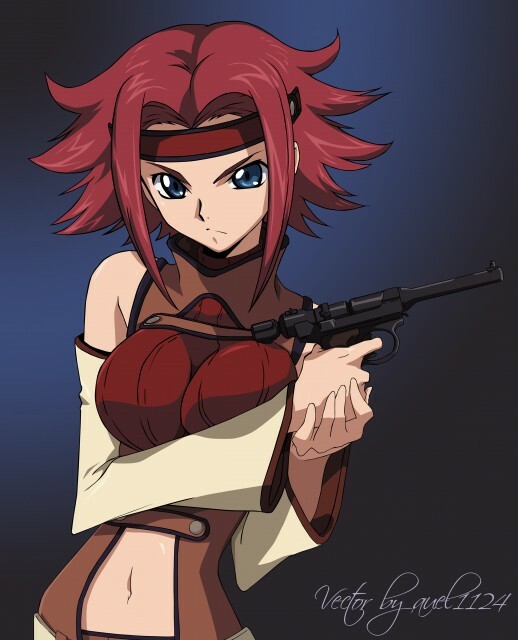 I agree that in terms of personality i would say Kallen is most alike to Cagalli but when i first saw kallen, the GSD girl that first popped into my head was Lunamaria. I guess it's because of Kallen's hair colour, being quite similar to luna's and all. Plus, Lelouch kinda reminds me of Shinn. In terms of their evil aura, cos as much as i love shinn, he ain't as smart as Lelouch. Besides, i also think that some characters from Code Geass were based off GSD. Like Kallen is a mix of Cagalli and Luna [Cagalli's persionality, Luna's looks] and you definitely know who Suzaku and Euphie would be in GSD. Haha, definitely Kira and Lacus.